Beijingers have been coughing and choking on the heavy smog in recent days, though according to official figures the air quality is "Good". The official line is not convincing anyone however, and there is a rising backlash on China's own microblogging platforms. Even some of China's media are becoming somewhat bold in observing that the poor air quality fails to match the official description. This week the US Embassy's air monitoring equipment measured the air quality as "Hazardous", and on several occasions it went "Beyond index". And even the China Daily was beginning to question whether official government readings were somewhat misleading. Visibility was reduced to less than 200 metres during the rush hour with the US embassy's air pollution index reading 500 at 07:00 on Tuesday. Our correspondent described the air as "Crazy polluted" on Tuesday morning, "So polluted the air quality scale is off the chart, maxed out at 500 level!" Such a reading is labelled as "Hazardous", and citizens would normally be advised to stay indoors as a precaution. 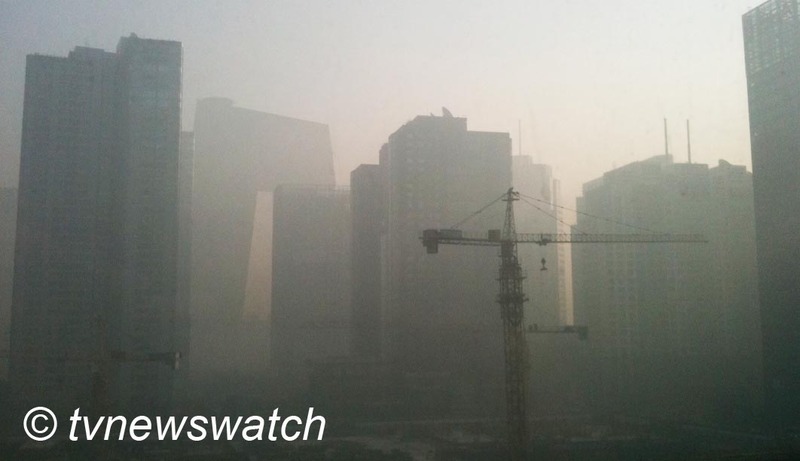 However there was no such warning from Beijing's municipal environmental monitoring center. Instead the air was described as "Good". 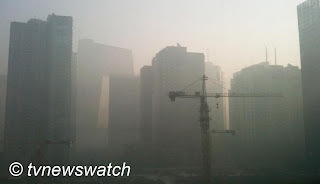 Beijing's Environmental Protection Bureau have agreed to release more detailed reports on air pollution and will begin to publish monitoring data on fine particulate matter before the Chinese New Year [BJEPB - Chinese / WSJ / BBC / China Daily]. Yet all too often one only needs to look across the city to see the air is far from clean. Authorities say they are making efforts to reduce air pollutants, but also blame the weather for trapping the pollution. However, Wang Qiuxia, a researcher at Green Beagle, an environmental protection non-governmental organization based in Beijing, says the weather should not be used as an excuse. "Although the foggy weather keeps the pollutants from dispersing, the PM2.5 readings wouldn't be this high if the city's air were clean enough, however heavy the fog is," she said.